Swiss luxury watch brand Baume & Mercier enhances its Clifton collection with three new self winding chronograph models which are powerful enough to handle the hustle and bustle of everyday urban life. Its understated, dynamic design is an expression of the strength of character of the person wearing it. 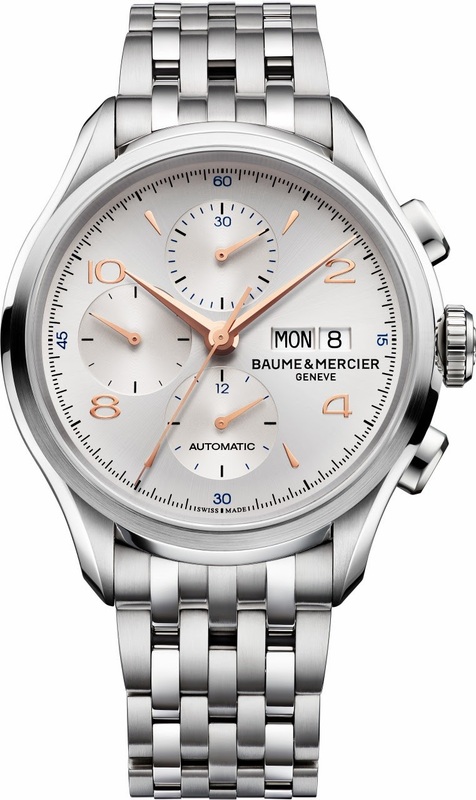 Baume & Mercier, founded in 1830, has always strived for perfection. Throughout its long history, the company has forged an image of timeless elegance, of refinement underlying consistent balance. 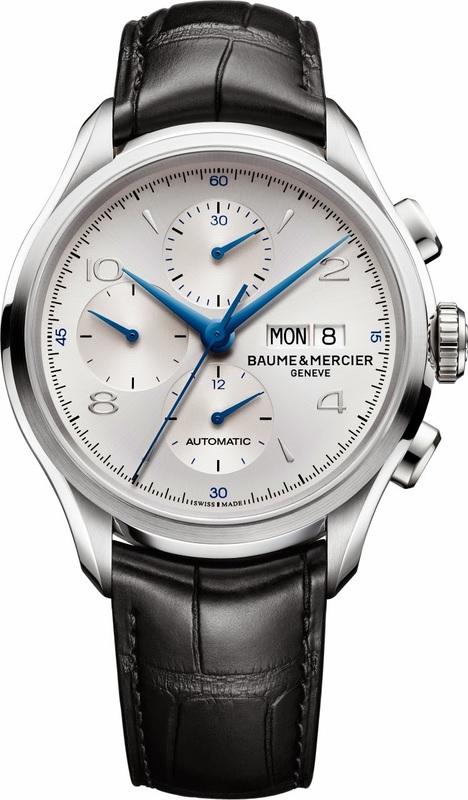 Today, Baume & Mercier is the seventh oldest watchmaker still in existence, and continues to uphold its motto, “Accept only perfection; only manufacture watches of the highest quality.”The deepest roots of its heritage resonate through this self-winding chronograph with exquisite finishes and a design inspired by timepieces from the museum collection. On first sight, the trained eye will note the historic inspiration of the Clifton timepiece and in particular the hallmarks of the “golden fifties,” a period considered by watchmakers as the golden age of wristwatches. The chronograph has been thoroughly reworked by the Baume & Mercier Design Studio to demonstrate balance through every detail of its design. This attention to detail imparts the full measure of tradition passed down through the abundant history of the watchmaker while bringing the model perfectly up to date. Stability characterizes the Clifton watch, with its sturdy, understated 43 mm steel case. Like all the pieces of this well-balanced collection, it contains a Swiss-made self-winding mechanical movement for reliability, endurance and precision (ETA 7750 Caliber). 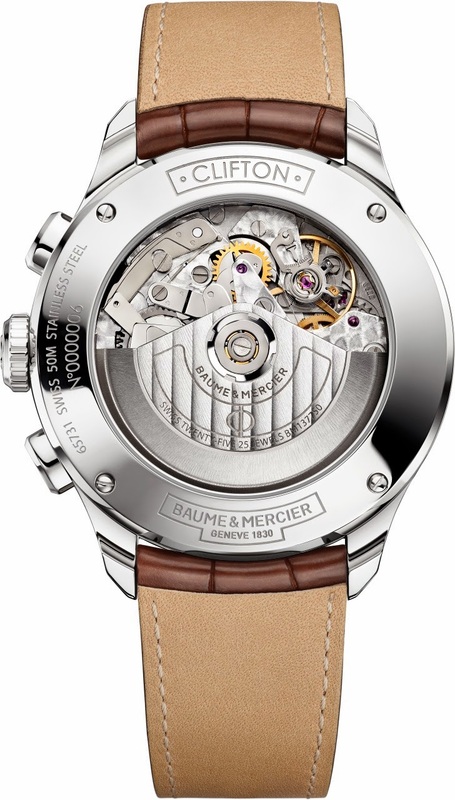 Manufactured to the highest Swiss watchmaking standards, the movement can be seen through the sapphire crystal case back. In addition to hours and minutes, the timepiece shows the day and date in an open display at the three o’clock position. When a slight pressure is applied to the push-pieces, the watch gives information on timed intervals using its large central seconds hand and interval display counters. This streamlined, eminently masculine chronograph, a new landmark in the Baume & Mercier collection, is available in three versions to suit various personality types. Purists will note the meticulously cambered curves of its subtly timeless design. Worn on an alligator skin strap fastened with a triple folding buckle with safety catch or for a sporty look, on a steel bracelet with flexible links, this watch reinforces the look of a modern gentleman. With the ideal proportions of its masterful design, the decidedly urban design of this 43 mm steel timepiece inspired by the “golden fifties” offers an undeniable vintage appeal. Its complication, specially developed to measure very short intervals of time, will satisfy the highest precision requirements of various professional and leisure activities. Featuring blued hands against a sun satin-finished silver dial, this model contains a sturdy, durable self-winding caliber, and is mounted on an alligator skin strap with large square scales fastened by a triple folding buckle with safety catch. This elegant watch will satisfy urbanites in search of a timepiece poised to triumph when confronted with any test. Reference: M0A10123. This chronograph has an undeniably traditional character, featuring a sun satin-finished silver dial to contrast with its golden hands and golden digits. The effect is further accentuated by a full grain brown alligator skin strap with large square scales, fastened by a triple folding buckle with safety catch. The most precious and undoubtedly the most “vintage” of the collection, this 43 mm steel watch contains a self-winding caliber known for its sturdiness. It will be the obvious choice for aficionados in search of a precise timepiece that age cannot alter. Reference: M0A10129. With its 43 mm steel case liberally inspired by a 1950s model, this chronograph plays on a tastefully sporty note, with a flexible steel strap made up of fine steel links. It will fulfil urbanites in search of a distinctly masculine timepiece or those living in humid regions. Water-resistant in five atmospheres, this efficient watch contains a Swiss-made, self-winding mechanical movement (ETA 7750) known for its durability. The trained eye will appreciate the open display in the three o’clock position that simultaneously gives the day and date. Reference: M0A10130.